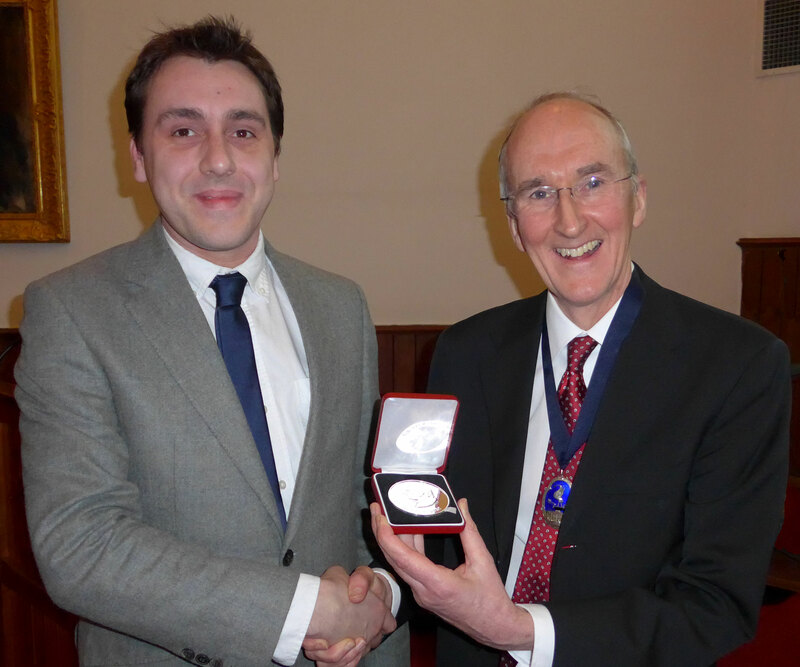 A beaming Owen Chambers holds his Jackson Rees Medal (and a cheque for £300 in his pocket). Clearly improving care in ventilated inter-hospital transfers can be very cost-effective as Dr Chambers has certainly found out! Congratulations to a worthy winner. 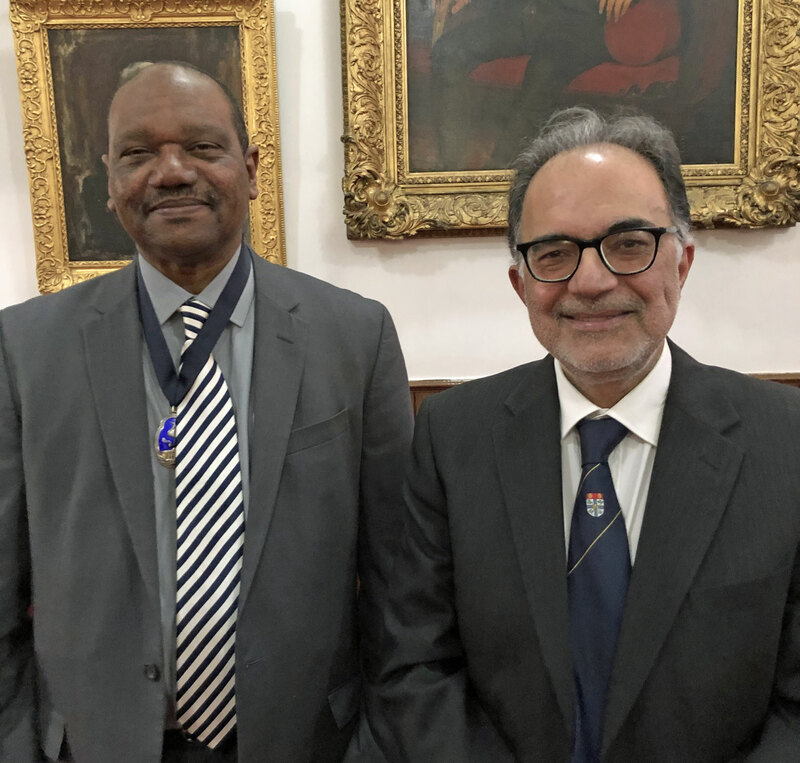 The society was very fortunate to have asked Prof. Ravi Mahajan to come to Liverpool to speak prior to his election to the office of President of the Royal College of Anaesthetists. The two Presidents are seen together, Dr Ed Djabatey(left) and Prof Ravi Mahajan. The society saved a fortune by getting one of the 'locals' to come and speak about 'End of Life Care' and the difficulties surrounding it. Few could have spoken more eloquently and passionately on this subject. As anyone that knows Dr McCrossan (right) will confirm, he dressed up specially for the occasion! The first meeting of the academic year saw the new President, Dr Ed Djabatey, take up his new role. 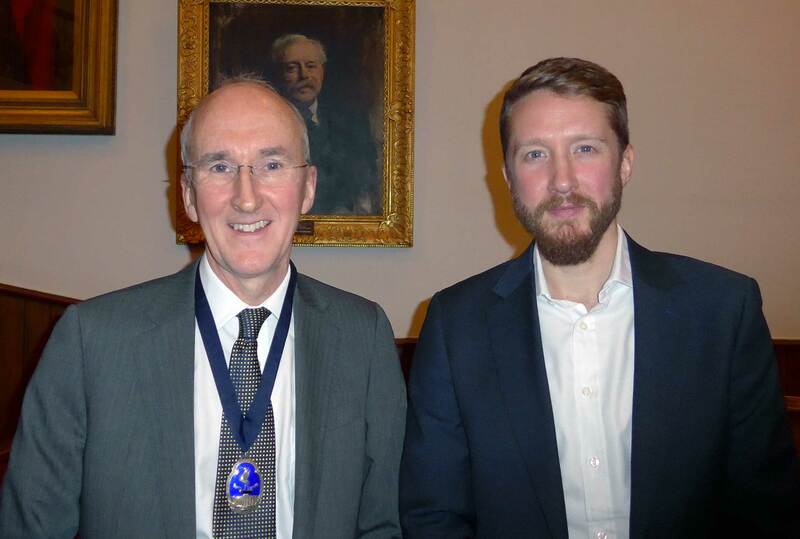 Here he can be seen with the speaker, Dr Michael Farquhar, who gave a very insightful talk about fatigue and the consequences of it on our professional performance. Clearly, he takes sleeping very seriously having already started to change into his pyjamas! With a new President to come and one known to everyone in the region, there can be no bigger personality to be the new frontman. 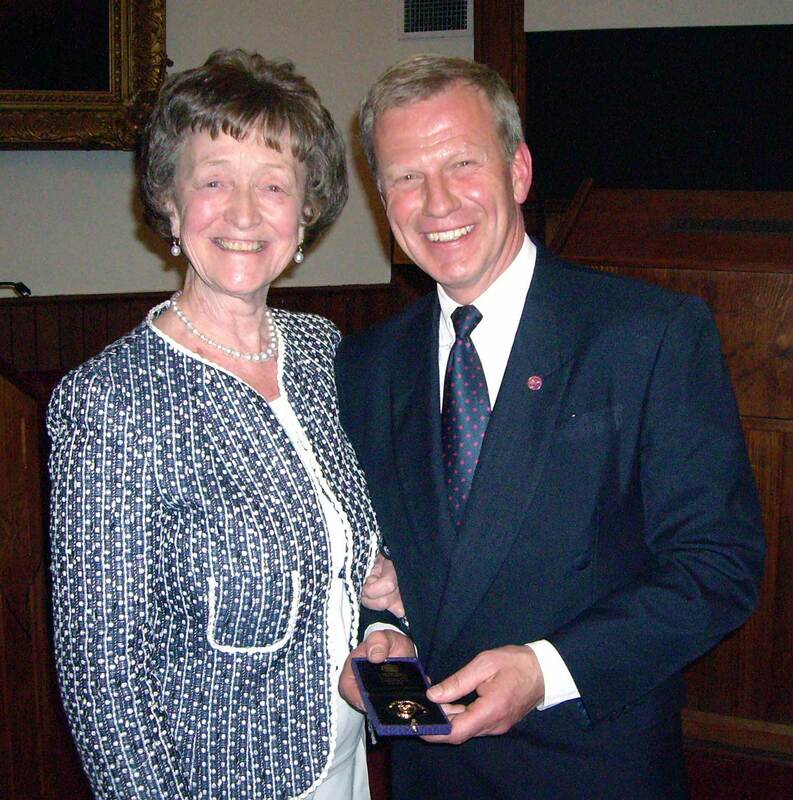 The Society was very sad to hear the news of the passing of Dr J.E. Riding CBE at the age of 94 years. Dr Riding or 'Dinge' as he was known to his friends, was Reader in Anaesthesia at the University of Liverpool becoming editor of the BJA for 10 years from 1963. 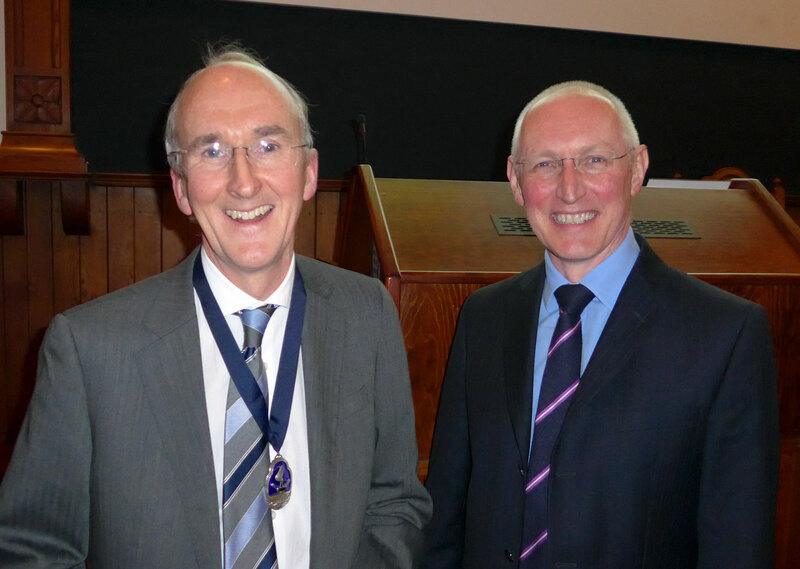 He became President of the LSA between 1970-72 (latterly becoming a Life Vice President) and Dean of the Faculty of Anaesthetists of the Royal College of Surgeons (the precursor of our College) from 1976-1979. Not only was he highly respected for his academic achievements but also for his abilities as a practicing anaesthetist. All this came with modesty and great humour with the consequence that he was a role model for all around him. Dr Clare Howard smiling with relief having deliverd her Presidential Address 'Charlatans and Quackery, the Benefit of Hindsight', an insight into the placebo effect that occasionally helped the vulnerable but was far more reliable in making the confident lots of money! 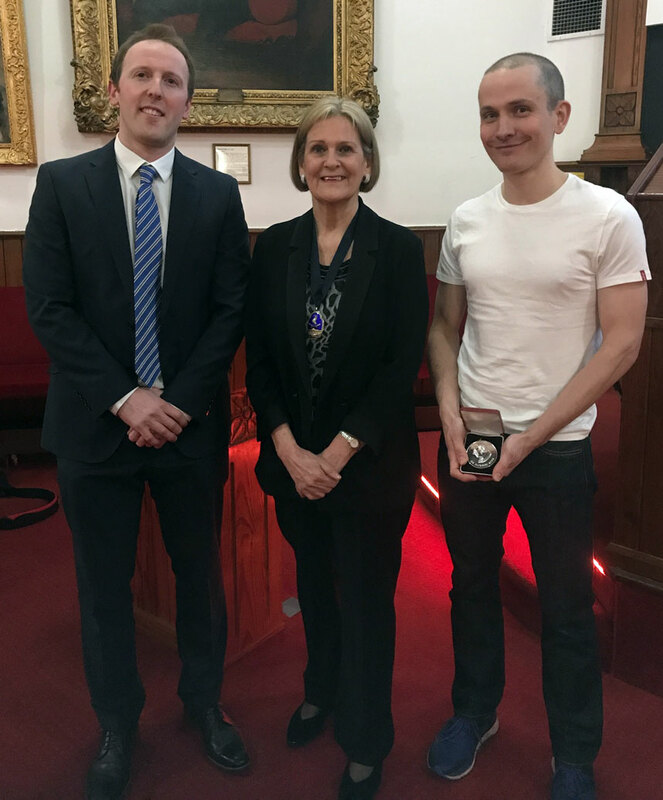 Congratulatiuons to Dr Mark Dunham (right) who won the Trainees' Prize Competition and Dr Dave Whitmore who was the runner up, both seen with the President, Dr Clare Howard. This was the week when the 'Beast from the East' arrived from Siberia. The winner was clearly not perturbed by the cold weather and to remain chilled for the event, presented in his vest! Professor Pirmohammed who is Professor of Molecular and Clinical Pharmacology gave an extremely insightful talk about the latest advances in Genomics and how these insights will help to personalise drug therapy and wider patient care. 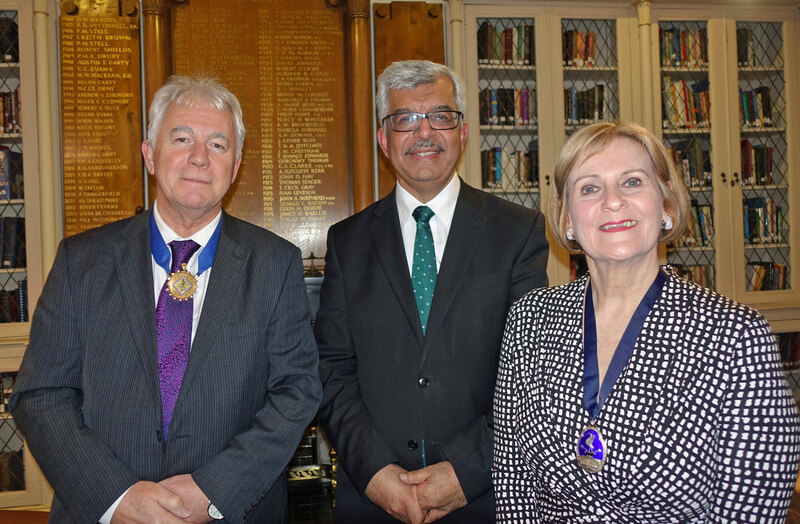 Prof Sir Munir Pirmohammed (centre) is seen here with Dr Colm O'Mahoney, LMI President and Dr Clare Howard. 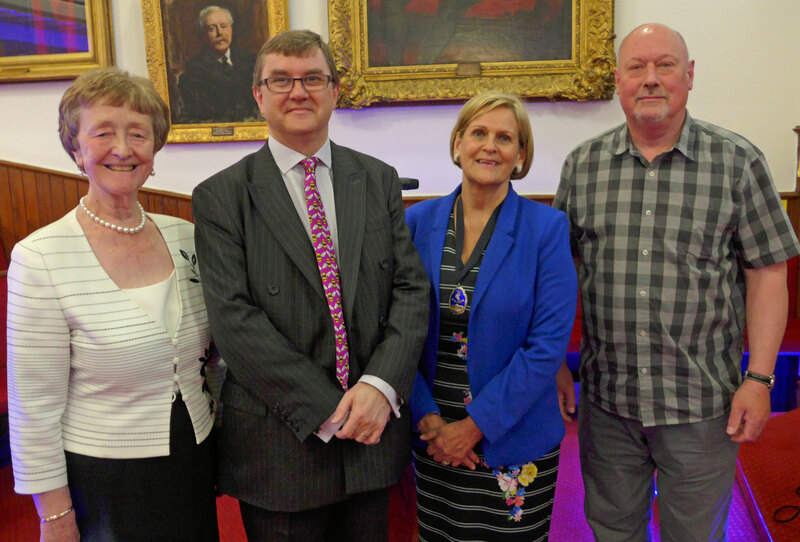 An excellent meeting with three local speakers, Drs Paul Jameson (left), Annette Davis and Will Gauntlett seen here with the President, Clare Howard. Despite the constant grind of working within the NHS, some have found time to use their skills abroad helping the less fortunate. It is with great sadness that the society learnt of the death of Dr Gordon Bush, a Life Vice-President of the socirety and former Consultant Anaesthetist at Alder Hey Children's Hospital. Dr Bush was an exceptional doctor, possessing great clinical acumen and technical skill, combined with a gentlemanly approach to everyone he met. He was well known and greatly respected by paediatric anaesthetists throughout the world. 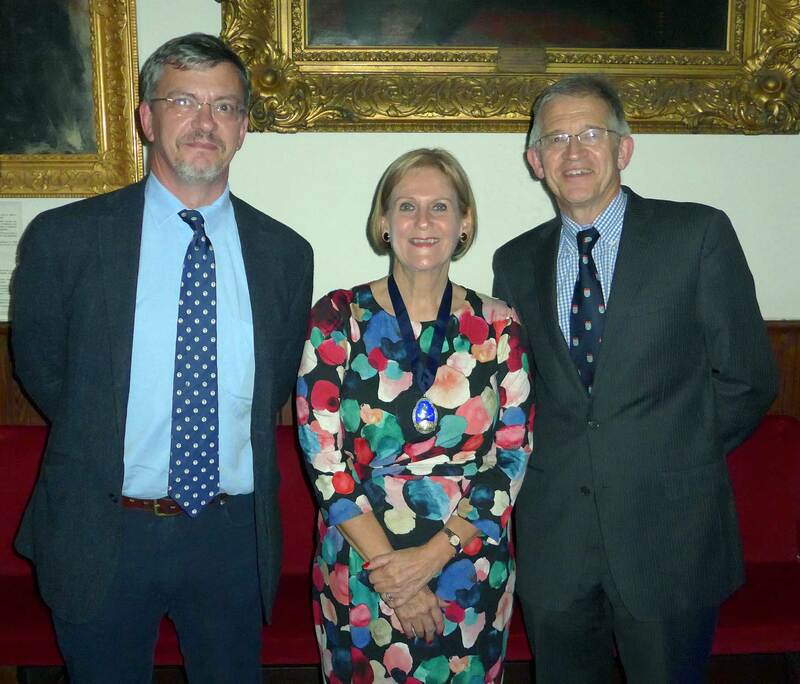 After the 4th very successful T.Cecil Gray BJA Medal lecture, Brigadier Tim Hodgetts is seen with Dr Clare Howard (centre) flanked by Professors Jennie Hunter and Nigel Webster (representing the BJA). 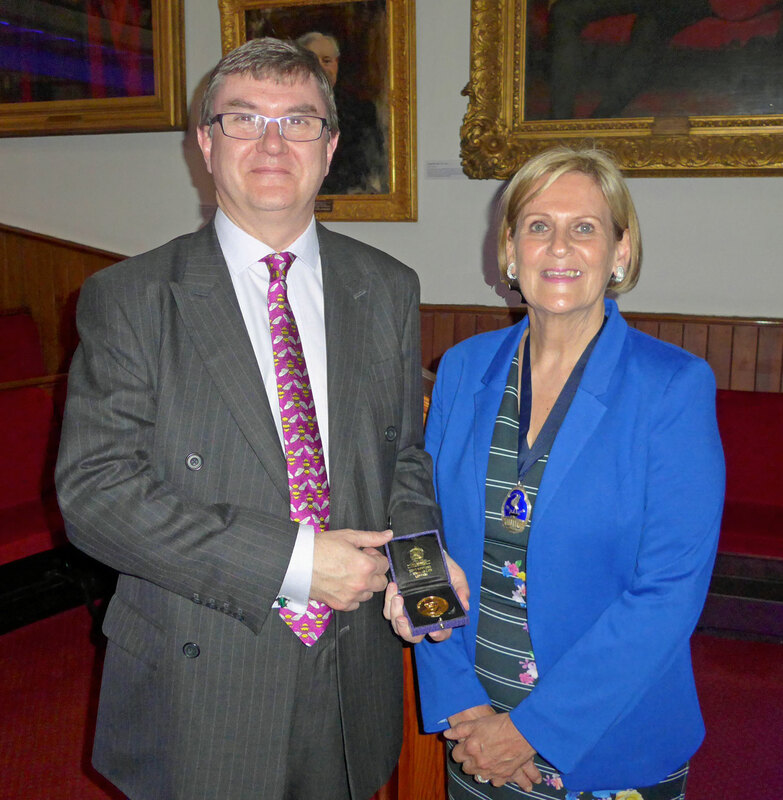 Brigadier Hodgetts is seen with Dr Clare Howard having been presented with his T.Cecil Gray BJA Medal. 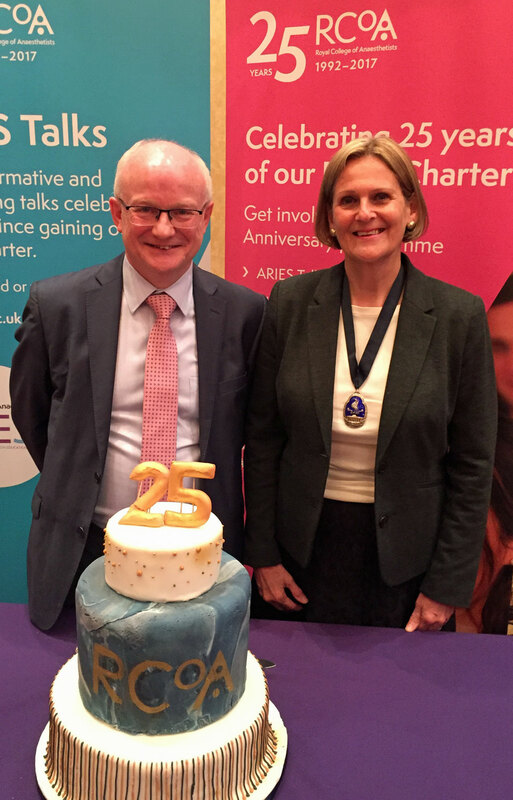 This March joint meeting with Manchester successfully celebrated the Royal College of Anaesthetists reaching its 25th year. 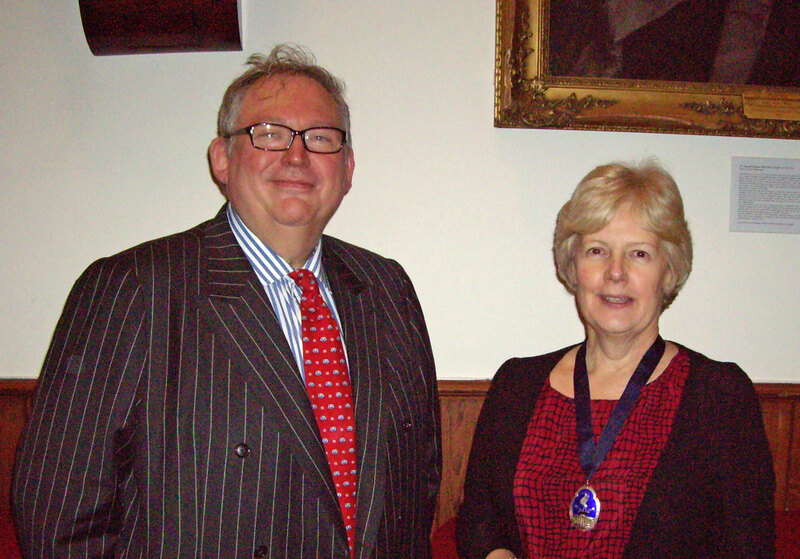 The President of the RCA, Dr Liam Brennan, attended the meeting (left) seen here with LSA President, Dr Clare Howard. The birthday cake was made by BBC Bake Off finalist and trainee in anaesthesia, Dr Tamal Ray. It isn't that often that so many current and former Presidents come together. 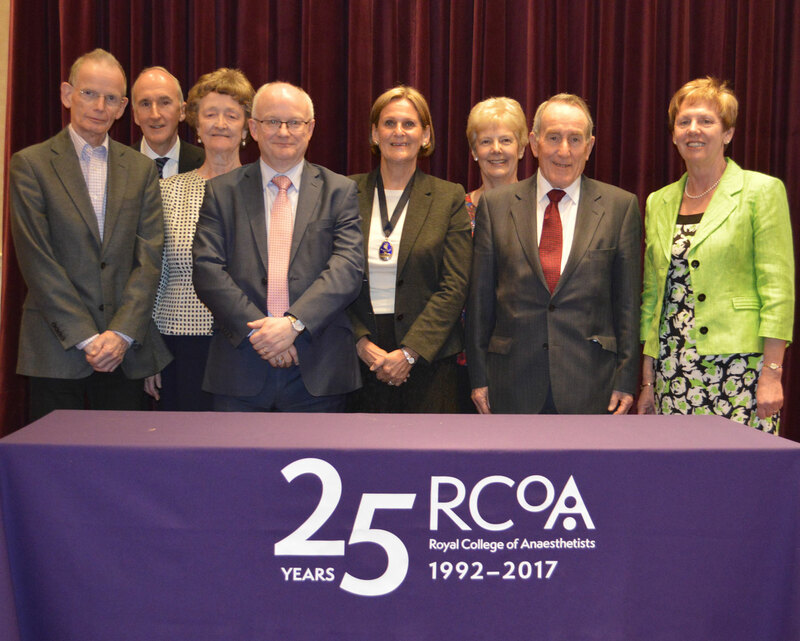 From left to right, Drs John Chambers, Ewen Forrest, Professor Jennie Hunter, Liam Brennan (RCA), Clare Howard, Janice Fazackerley, Raymond Ahearn and Chris Bell. 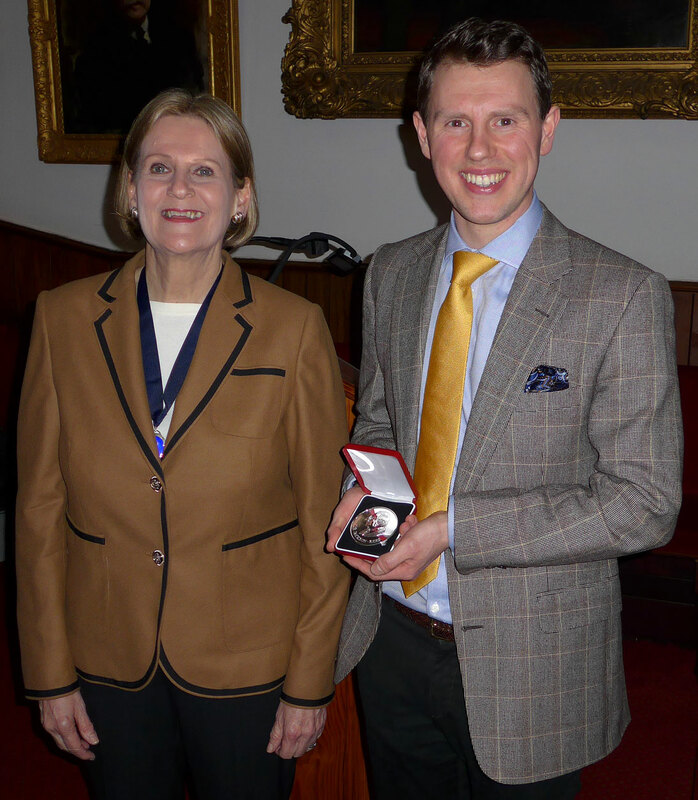 Congratulations to Dr Richard Berwick who won this year's Trainees' Prize seen here with Dr Clare Howard and his Jackson Rees Medal. The President was most impressed with the dapper and stylish dress sense of the winner and thought that his presentation had a similar sartorial elegance. 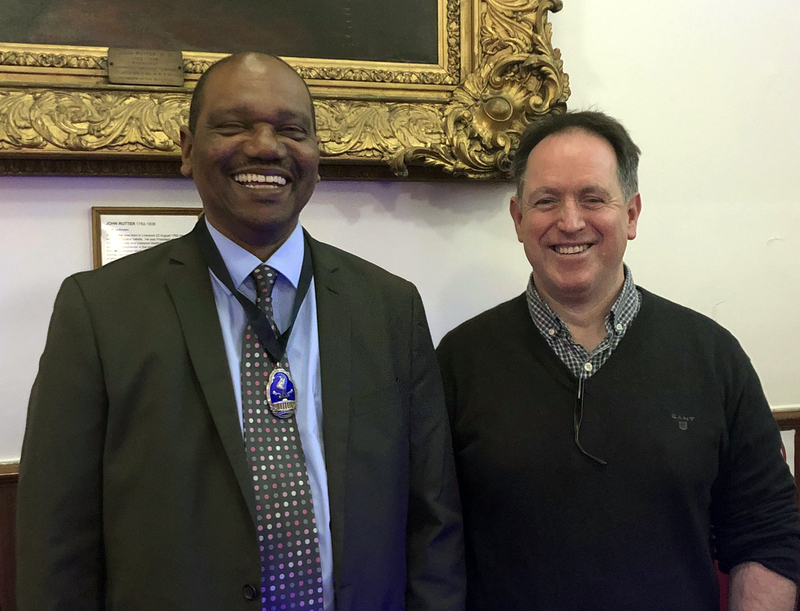 Professor Curran (right) who is Professor of Innovation & Excellence in Healthcare Education at Queen Mary University of London and Assistant Director of Education and Professional Standards at the GMC, gave an excellent talk about the GMC's aims and objectives for the future direction of training. The second meeting hit a last minute snag when one of our two speakers couldn't attend due to ill-health. Fortunately, our second speaker agreed to fill the void and presented a very comprehensive account of the topic. Our speaker Dr Balaji is seen with Dr Howard. The first meeting had an excellent speaker, Dr Barry Miller, who enlightenend the audience about the past and future of training in Pain Medicine. Sadly, the audience seemed to be made up more of those who had good reason to go to a Pain Clinic rather than training to treat those attending! They also missed an excellent example of how not to ask the speaker a question. It seems that there's always something to be gained from coming to these meetings! With the new academic year looming, the soon to be former President hopes that the programme will be attractive to many in the region. We have even got rid of the seemingly unpopular Friday night meetings although some saw it as a good excuse for some 'pre-loading' over dinner afterwards. The message is really 'use it or lose it' because a significant number of attendees are retired members who, without their attendance, would make the room look very empty. In his last meeting at the front of house, the President, Dr Ewen Forrest, used his address to talk about something far more important than anaesthesia; sport and in particular the legend of Bill Shankly, a charismatic and ambitious leader who turned this city's name into a symbol of sporting dominance that was to endure for three decades. The audience was principally made up of those from the Shankly era which was slightly disappointing as this was a talk far more about values and leadership in the context of sport. 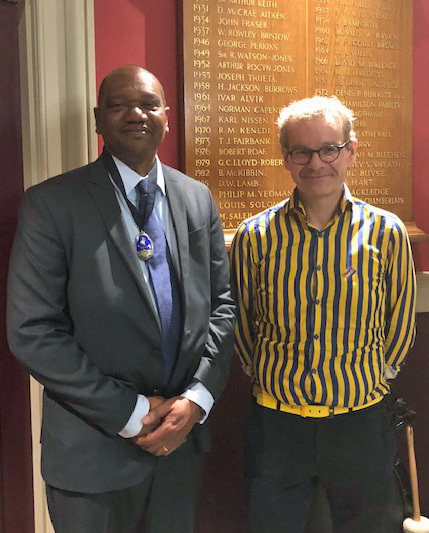 A joint half day meeting with the Section of Anaesthesia of the Manchester Medical Society was hosted at the Park Royal Hotel by the Liverpool Society of Anaesthetists on the topic of 'The Bleeding Patient'. This was well attended and those that were there were rewarded with four very insighful talks. 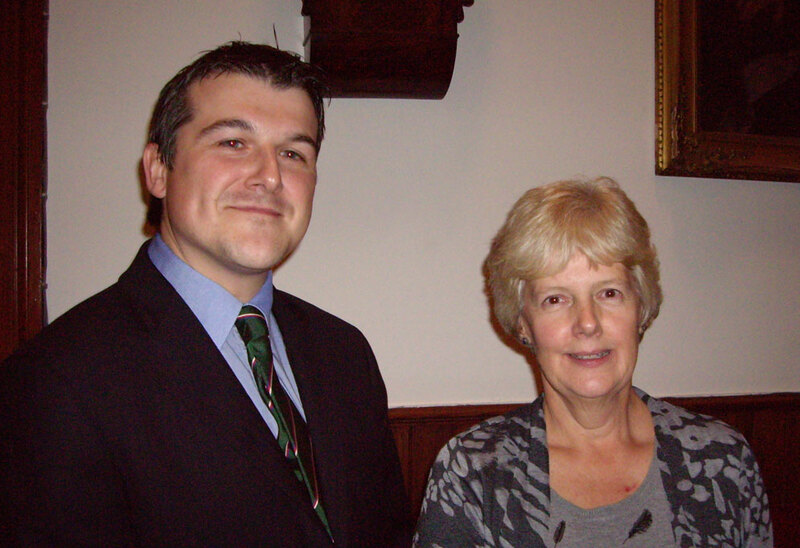 MMS Anaesthesia Section President, Dr Donna Greenhalgh is seen with LSA President, Dr Ewen Forrest. 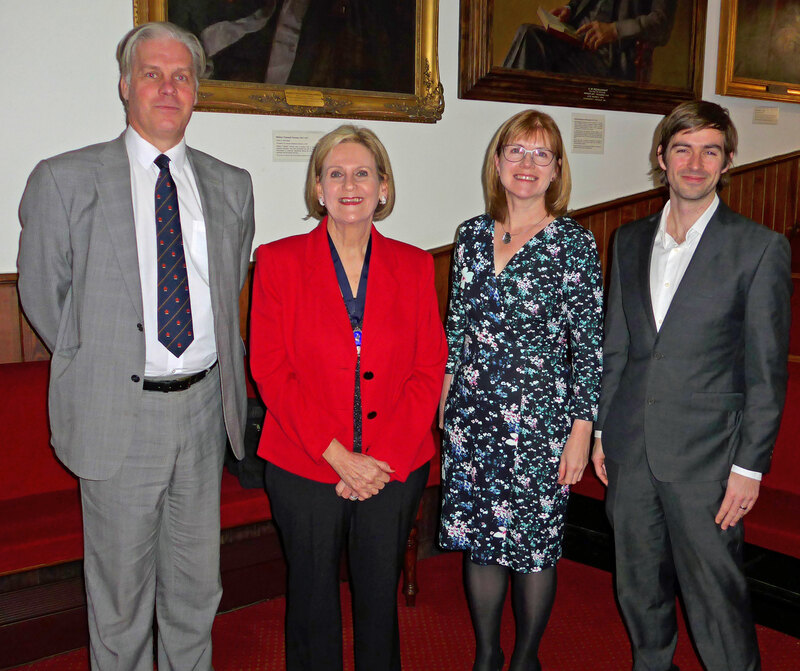 The Trainees' Prize meeting had five excellent presentations so congratulations to all! There was also a good-sized audience including many trainees supporting their peers. 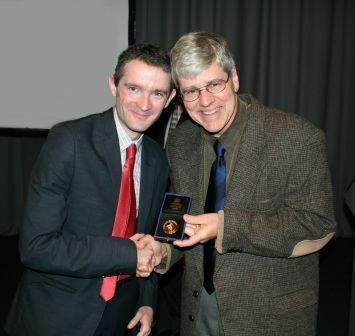 The winner was Dr Nick Lown (pictured below being presented with the Jackson Rees Medal by LSA President, Dr Ewen Forrest). The runner-up was Dr Richard Dodwell. Another meagre audience at the January meeting heard an excellent talk given by Dr Micheal Stewart, who discussed the management of patients with raised troponin levels in the peri-operative period. This insightful and scientific talk on this area of peri-operative medicine highlighted the difficulties encountered but also stressed the importance of good basic medical care in this group of patients. What a shame no more heard this message? 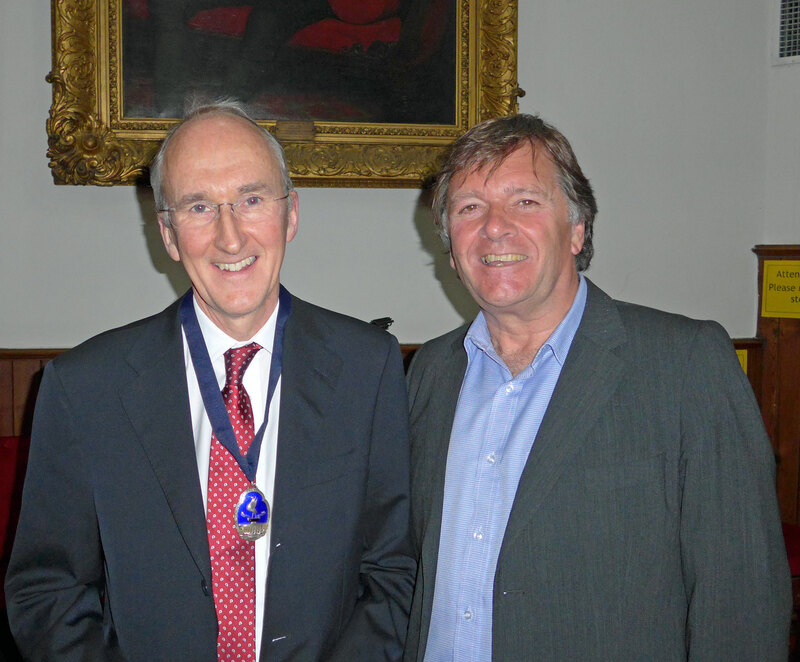 LSA President, Dr Ewen Forrest is seen with Dr Michael Stewart (left). The President is becomng increasingly bemused at the poor turnout by working members of the society despite the high relevance of the topics covered at the meetings. Fortunately, retired members continue to be supportive but then what's the point of the society? Is it a retired members' dining club or a society to provide education on relevant topics to the practice of working members with an added social aspect? The President is always very pleased to hear from members who would like to suggest a different format for meetings to better suit their busy lives. The meagre audience heard from Dr Matt Oliver who has been one of the RCA co-ordinators for the National Emergency Laparotomy Audit which recently produced its report. He gave a very insightful exploration of the findings of this large audit in which all of our local general hospitals took part and discussed the lessons learnt to improve the care of this high risk group of patients. The audience was both informed and entertained by Captain Trevor Dale (seen on the right) describing the characteristics of an ideal team. However the President was horrified to realise that he had many of the features described by Trevor Dale as being that of a dysfunctional team member! These types of individuals had been 'let go' from British Airways. Fortunately the NHS is always pleased to employ the unemployable so the President currently feels safe in his role! 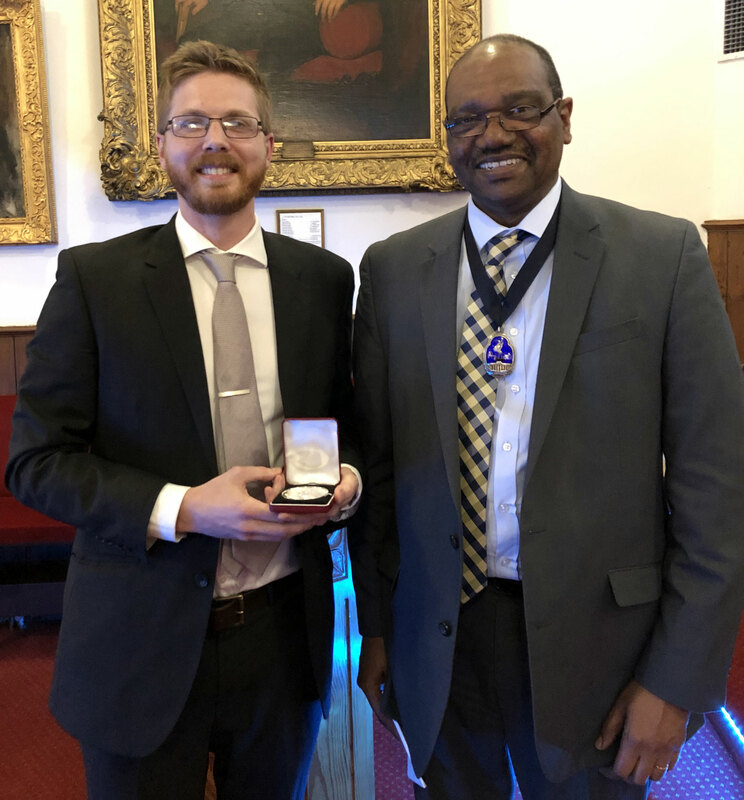 The first John Utting Award was granted to Dr Luke Winslow, who had presented a project as a poster at the recent European Society of Intensive Care Medicine Congress in Berlin. Here he can be seen with the President having been given the award (after the chequebook had been found). With the new academic year starting next month, the joint meeting with the MSA comes first. Rarely does the society invite a non-medical speaker but next month, we have a former BA airline captain to discuss how we can learn from one of the safest industries in the world about how passenger safety has been so greatly improved over recent years. Apparently they have dispensed with the tickbox culture where going through the process is more important than the end result. We clearly still have a great deal to learn! 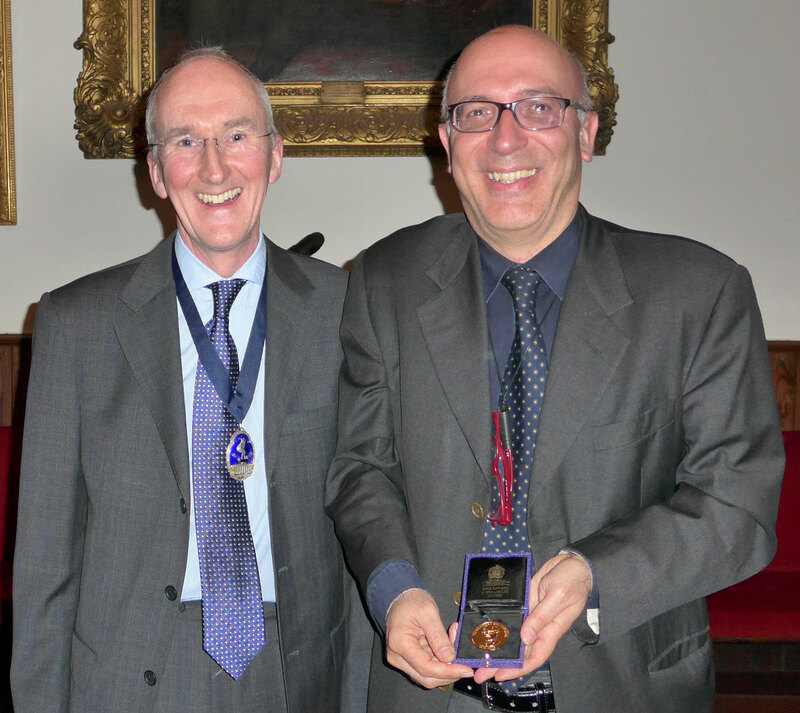 Another memorable T.Cecil Gray BJA medal lecture, this year presented by Professor Paolo Pelosi from Genoa, Italy who talked about the scientific evidence promoting lung protective mechanical ventilation. This was a very well argued presentation full of academic research content with a simple message for all anaesthetists and intensivists. 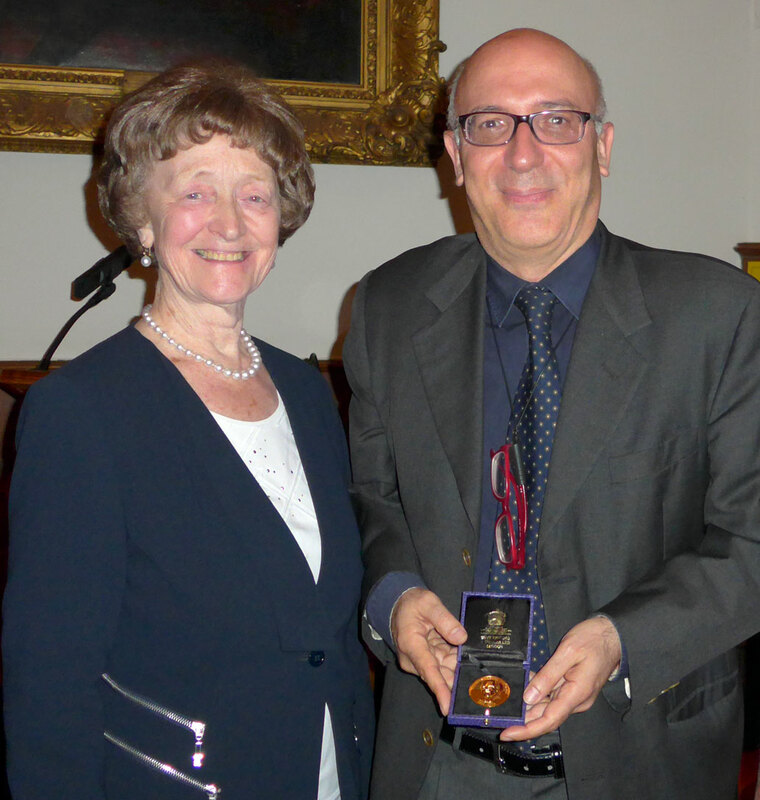 LSA President, Dr Ewen Forrest (left) is seen with Professor Pelosi holding the T.Cecil Gray BJA medal. 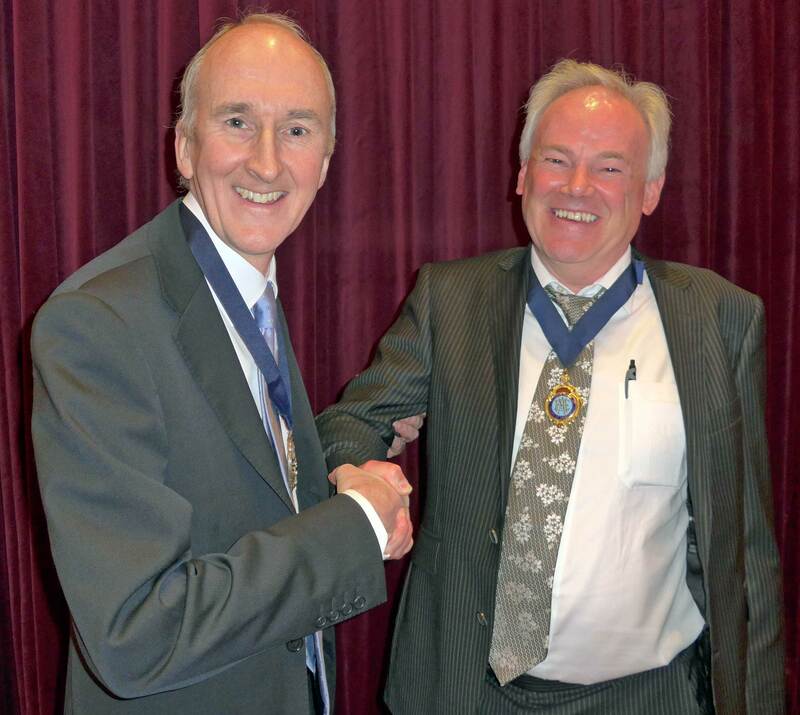 LSA President, Dr Ewen Forrest shakes hands with his counterpart, Dr Richard Wadsworth, President of the Section of Anaesthesia of the MMS. The joint meeting turned out to be yet again of excellent quality with four speakers who knew all about the topics on which they presented. Perhaps the most insightful was Professor Ben Bridgewater's talk around the information that we give to patients about outcomes. The website of the Society for Cardiothoracic Surgery has some very insightful facts for patients and Professor Bridgewater suggested that anaesthetists should be more transparent about themselves and their own practice. Clearly he may have a point if we want to style ourselves as 'Peri-operative Physicians'. Five excellent presentations were given this year by trainees ranging in experience from CT2 to ST7. The subjects were all clinically relevant and exemplified how to present cogently and to time whilst under pressure. What a great shame that the attendance was, as usual, poor from their friends, peers and seniors. Mind you, people always seem to have such good reasons for not being able to support their colleagues. The first meeting of the new year was earlier than usual but very well attended when Professor Pearse discussed patient outcomes after major surgery and in particular, his view that anaesthetists should become far more like peri-operative physicians, relegating surgeons to becoming mere technicians of the operating theatre. What a turn around that would be and something that orthopaedic departments would be very pleased to embrace? 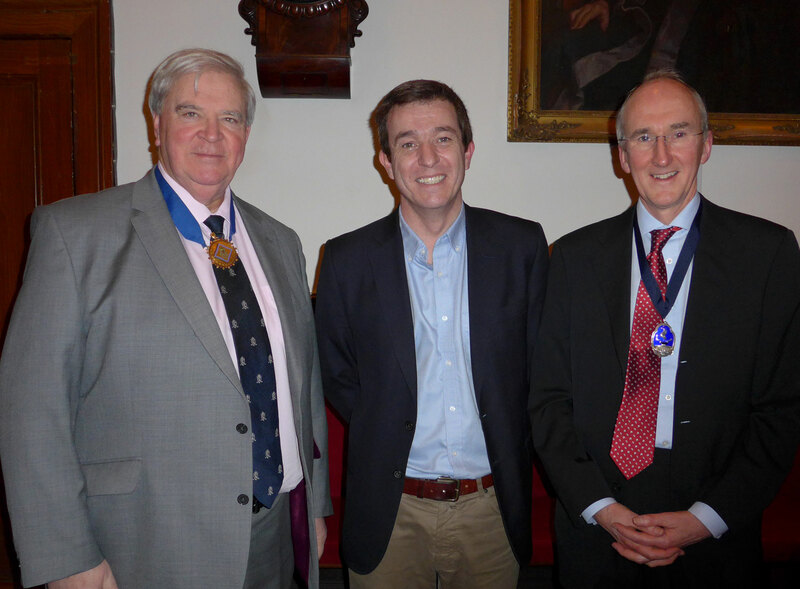 Dr Mike Osborn (left) and Dr Rowan Hardy (right) are pictured with the President, Dr Ewen Forrest. Another superb and well illustrated talk about a fire in the Bath Intensive Care Unit, the most interesting part being the discussion by Dr Mike Osborn about its psychological consequences, principally to the staff. This talk appropriately had just as much to offer the generalists as well as the intensivists because very few of the latter seemed to be present. This was unfortunate with the society paying tribute to Dr John Harrison, a consultant anaesthetist and intensivist at Aintree University Hospital who very sadly died last month. The academic year is soon to start and members await with great anticipation the inauguration of the new President. The first talk has, as usual, an educational theme and the new President anticipates a big turnout from the specialty registrars, so many of whom claim to be very interested in education at their ARCPs. At least next July, a small amount of evidence can be produced to demonstrate this by the presence of their October LSA CPD Certificate in their e-portfolio! Dr Janice Fazackerley presented a wide-ranging talk touching on football, the local history of the two cities, the cleaning up of the Mersey and the input that the BJA has had from the North West. Those that attended witnessed an excellent talk that had great relevance and interest to all of us in Merseyside. The next President should start planning his address soon if he is to come anywhere near the latest standard set for this event. 'The Occasional Specialist' joint meeting with Manchester was well attended and those present were rewarded by five excellent presentations given by recently appointed members of the consultant body of the region (although a couple were into their second appointments!) Much (perhaps too much) ground was covered and had Dr Murphy's talk been as short as his locum consultant post in Chester, there might have been time for some questions. The standard of presentation of all the entries at this year's Trainees' Prize meeting surpassed those in previous years and the audience marking was very close. The winner was Dr Rashmi Khirwadkar whose presentation contained a number of pleas to the CD at the Women's hospital (sitting in the audience) for a consultant post to be advertised as soon as possible as she approaches CCT! Clearly she still has a lot to learn about who controls the finances in the NHS. 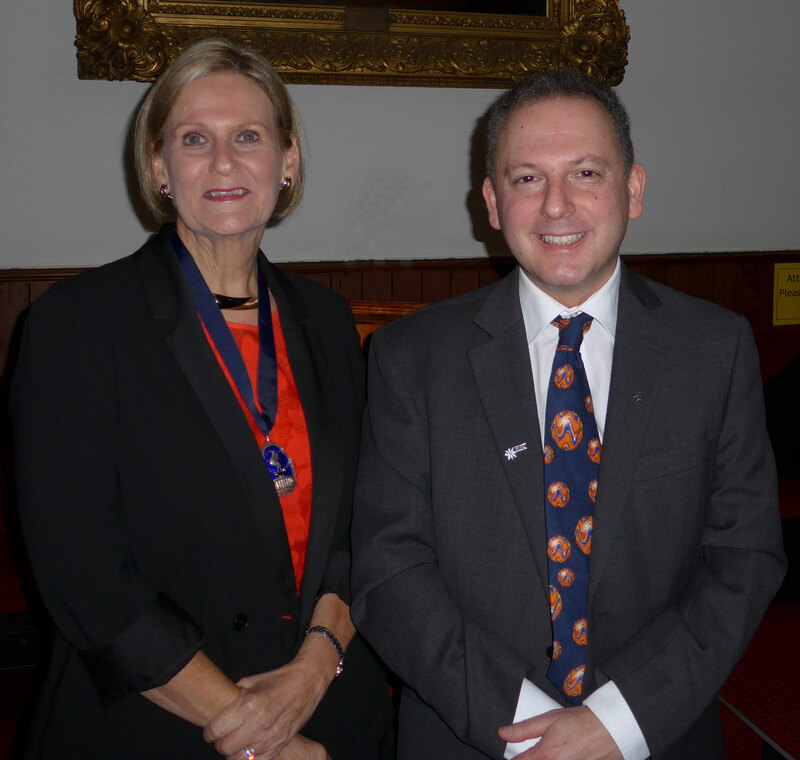 Professor Julian Bion (left), the immediate past Dean of the Faculty of Intensive Care Medicine, is seen with LSA President Dr Janice Fazackerley. Professor Bion looked at how to improve the quality of healthcare with particular emphasis on critical care medicine. This was a lecture with vast content within both the slides and his verbal commentary on them. It highlighted the ever increasing complexity of healthcare in this country and the reasons why most of us feel increasingly powerless to bring about significant change within it. The message was not to give up! This meeting addressed the dilemma of how to anaesthetise two children simultaneously when they're attached to each other. For most anaesthetists at the Royal or Aintree, anaesthetising one is too challenging to contemplate and even at Alder Hey, the thought of two at once would be extremely daunting but we heard how those clever doctors down in London don't seem to be phased at all. Dr Ann Black showed us the value of good planning and team work particularly when everyone's watching. 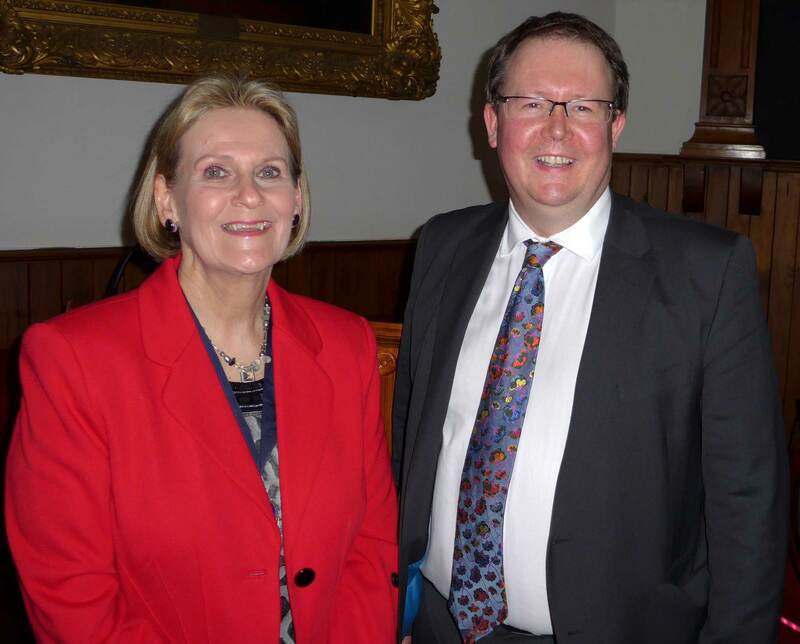 We started the new academic year with a particularly notable speaker, Dr Ellen O'Sullivan, who began her consultant career at Aintree. 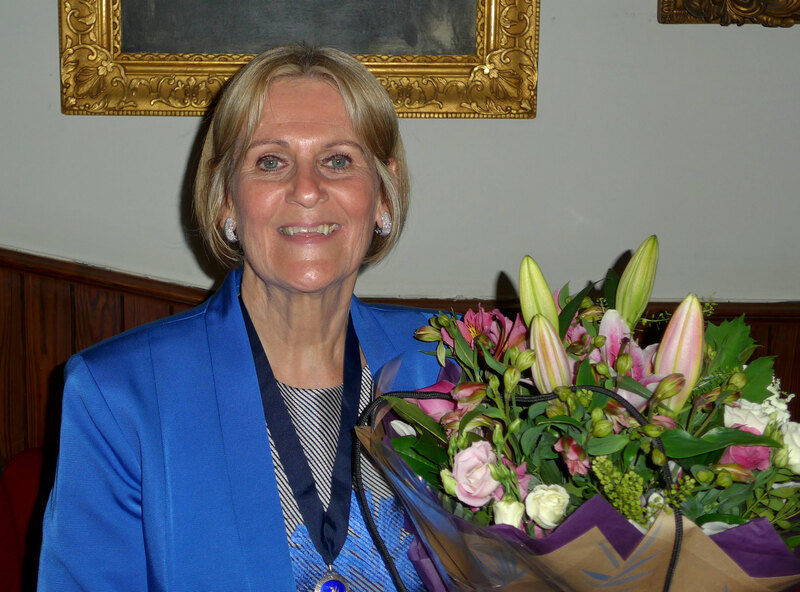 Once she left, her career rapidly took off and she is now the President of the College of Anaesthetists of Ireland and council member of the AAGBI. 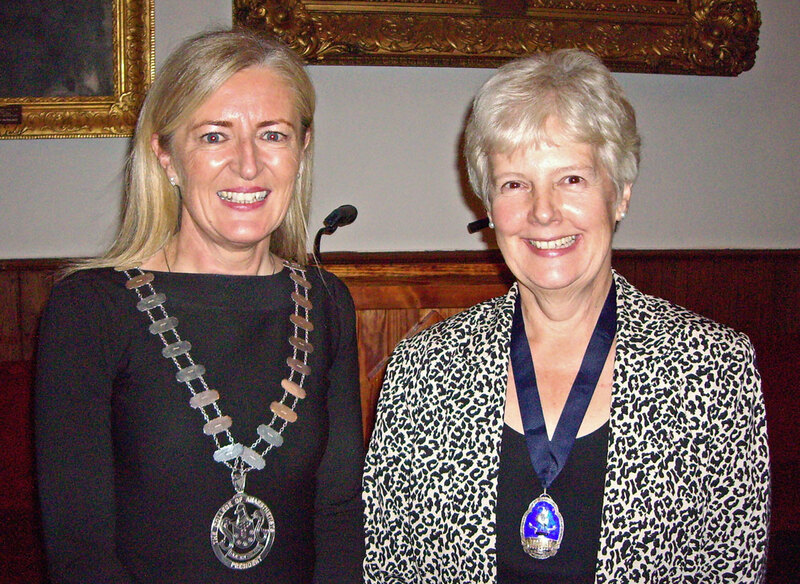 Dr Ellen O'Sullivan President of the College of Anaesthetists of Ireland is pictured with the LSA President, Dr Janice Fazackerley. 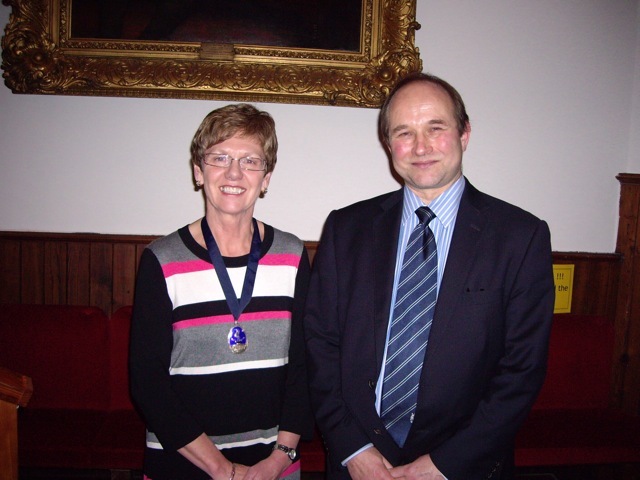 Professor Eriksson is pictured with the President, Dr Janice Fazackerley holding the T.Cecil Gray BJA Medal with which he was presented. 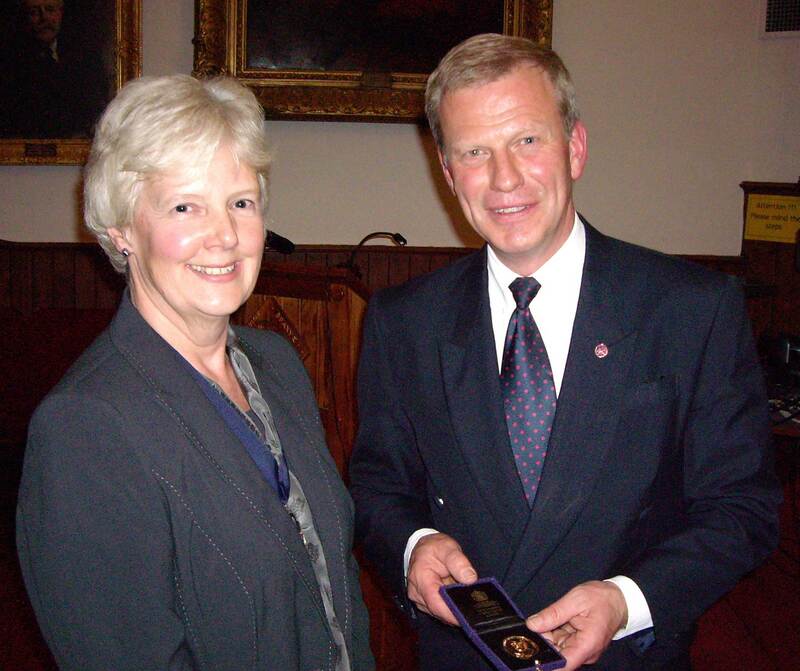 A superb lecture on neuromuscular function was given by Professor Lars Eriksson who is pictured here with former President of the society, Professor Jennie Hunter. If you didn't attend this event, you missed a lesson in presentation skills, which demonstrated why the basic science of this topic is of such great importance to all practicing anaesthetists. 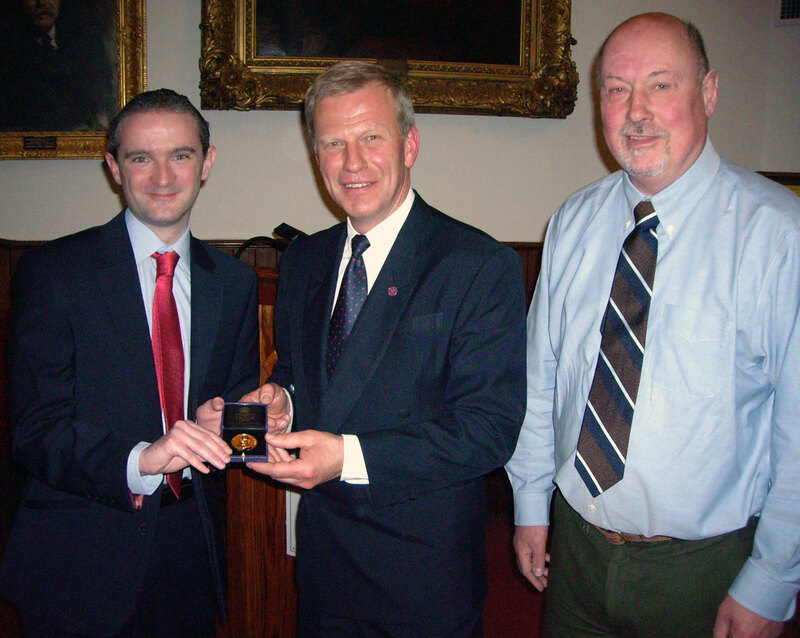 The T.Cecil Gray BJA Medal is presented to Professor Lars Eriksson by James Gray, son of Professor T.Cecil Gray and Professor Nigel Webster, representing the BJA. 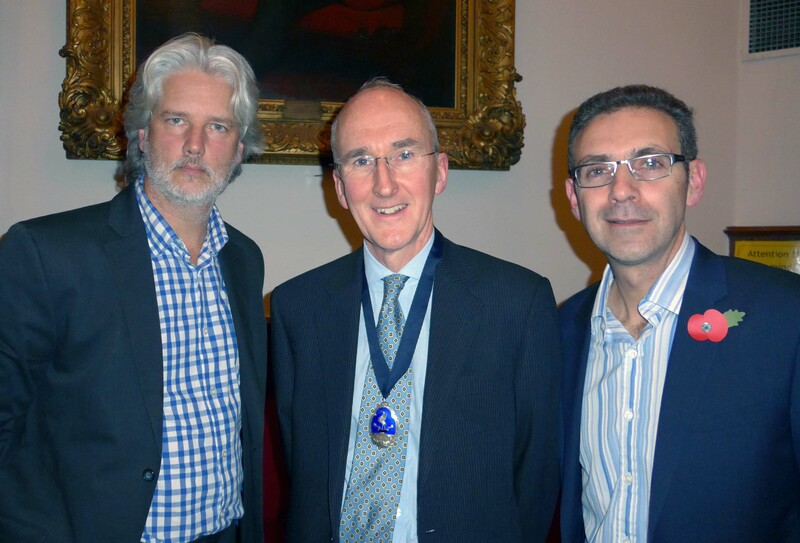 Three Presidents together at the recent joint meeting withe Manchester Medical Society. 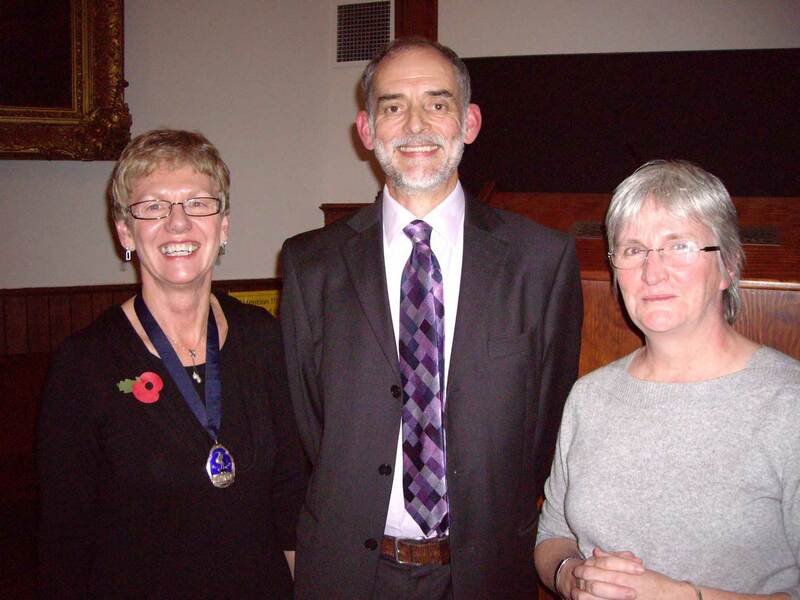 Dr Janice Fazackerley, President of the LSA with Dr David Whitaker, President of the MMS and Dr Johanna Ryan, President of the Section of Anaesthesia of the MMS. A very successful meeting in Warrington with Manchester demonstrated the many excuses that we anaesthetists can find to avoid the tedium of routine lists. The first speaker had more letters after his rather long surname than in it. Needless to say, he wasn't actually an anaesthetist. He gave an excellent talk and the trend continued for the afternoon. 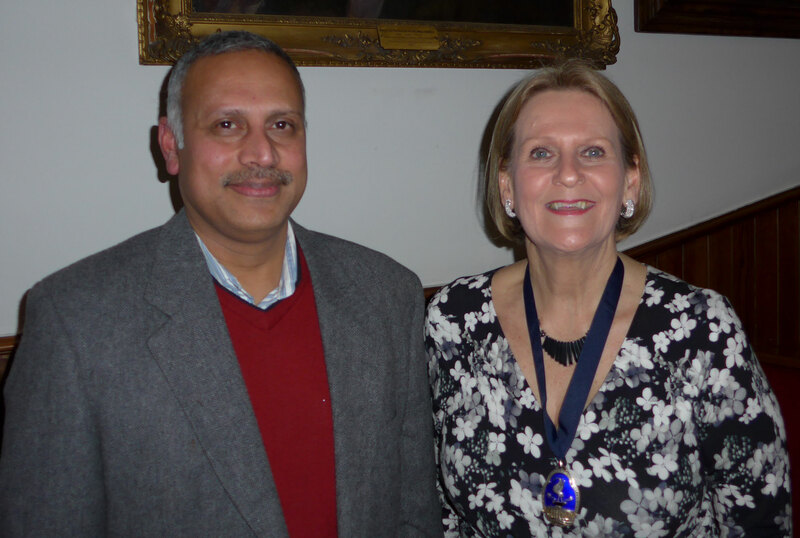 Congratulations goes to Dr Helen McNamara for winning the Jackson Rees Medal and also to Dr Raj Malhotra for being placed second. The usual high standard of presentation was maintained by all the contestants on the evening. Dr Trafford (pictured with Dr Fazackerley) spoke about his long association with motorsport and the problems with which he regularly has to contend as an expert medical adviser to the FIA. However he did say that having to turn left whenever he boarded a flight to the next event wasn't among them. 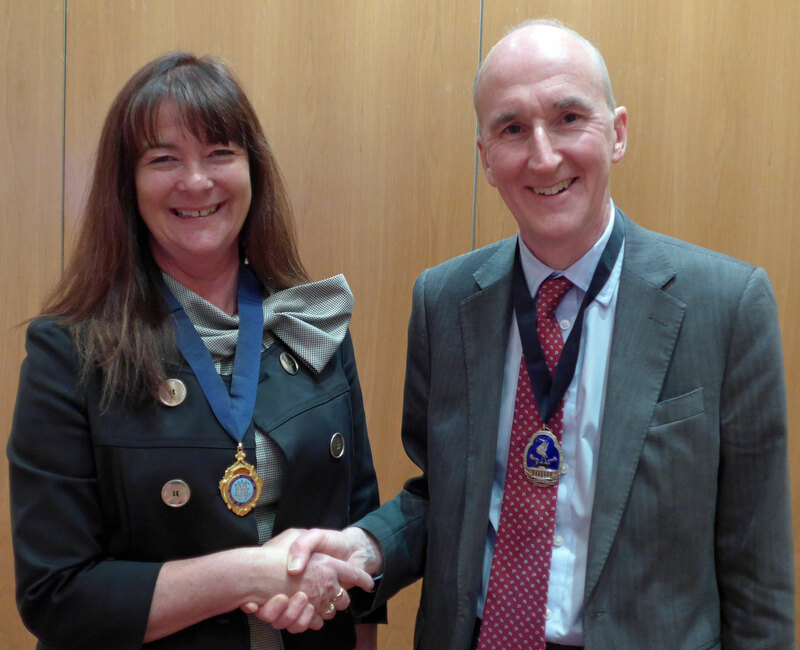 Dr Fazackerley has been elected to the Council of the Royal College of Anaesthetists. She wished to thank all members for their support in the recent election. 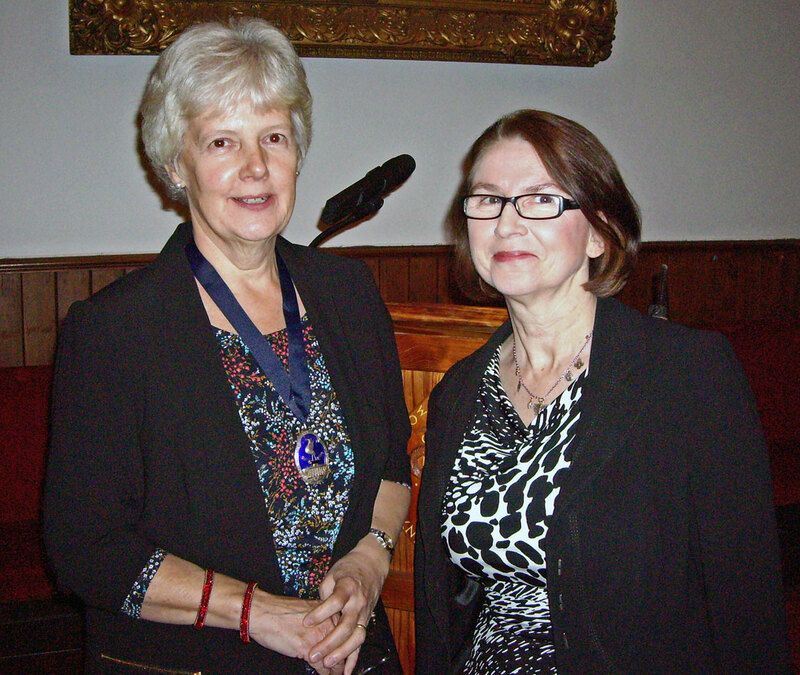 The November meeting was hosted by Immediate Past-President Dr Christine Bell as Dr Fazackerley raced back from fog bound Southampton, after attending a family function, to present Dr Mercer with his SpR application form. Dr Fazackerley emphasised that it was the quality of this document and his interview performance that got him a post in Mersey and not the fact that the Triservices would be paying for his entire salary. With only muted laughter, it would appear that most of the audience were convinced by this dubious explanation. 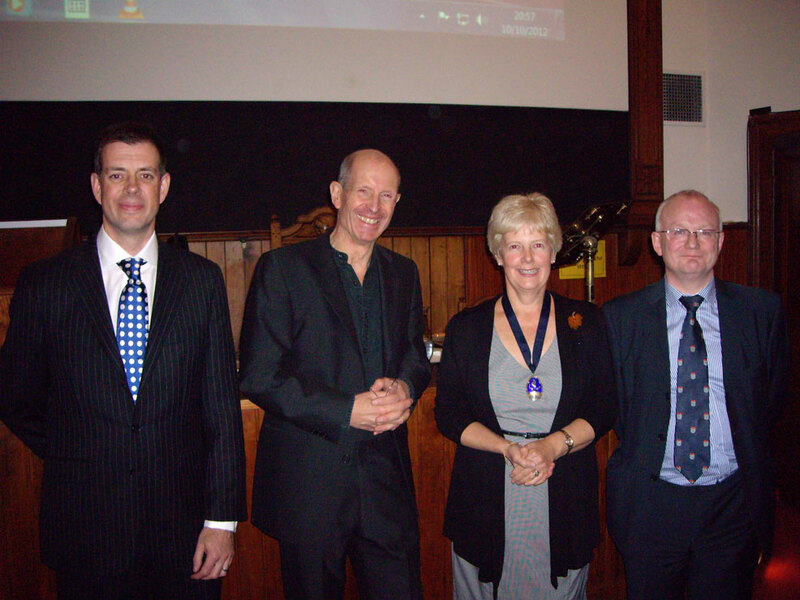 The panel from the meeting pictured with the LSA President, Dr Janice Fazackerley. From Left, Mr Richard Bryant, Director of Training and Examinations at the RCA, Dr Simon Bricker, Dr Janice Fazackerley and Dr Liam Brennan, the current chair of the examination committee. 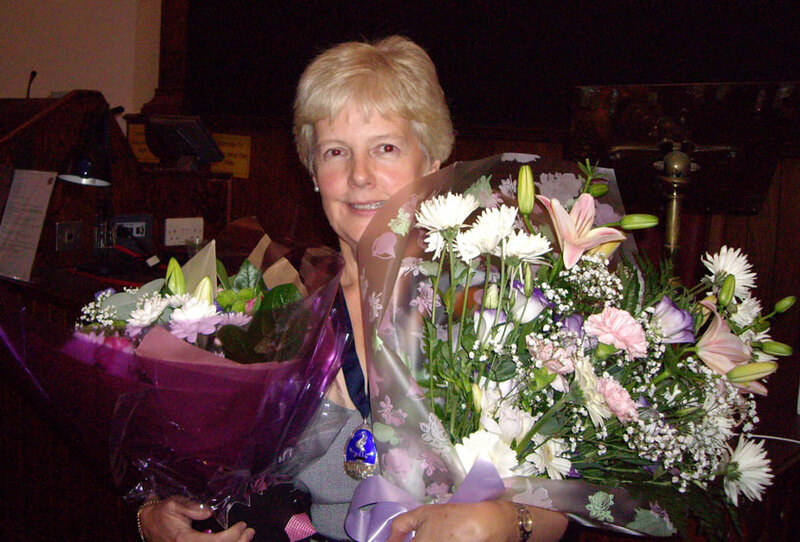 Dr Janice Fazackerley takes up her role as President of the Society and unexpectedly finds herself engulfed in flowers. The new academic year starts in October with Dr Simon Bricker, who'd originally hoped that success with his books on the FRCA exam would make him wealthy, talking about his experience as an examiner. He is paired with Dr Liam Brennan who will be coming up from the RCA to talk about the ever evolving structure of this important hurdle. 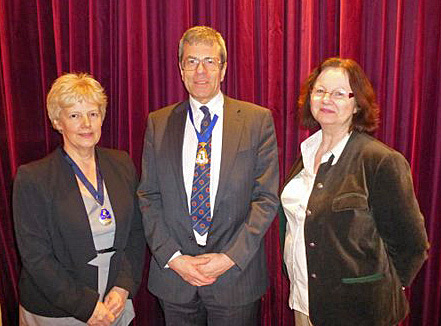 The T. Cecil Gray BJA inaugural lecture was held on May 12th 2011 as part of Professor Hunter's Festschrift meeting. It was given by Professor Steve Shafer, Editor in Chief of Anesthesia and Analgesia, Professor of Anesthesiology, Columbia University, New York. 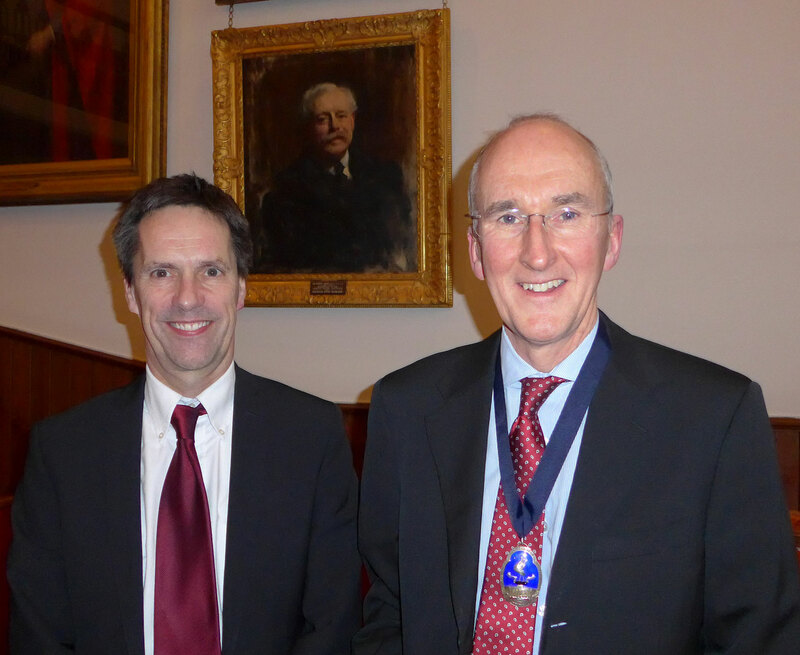 This lecture, to commemorate the contributions of T.Cecil Gay to anaesthesia, is anticipated to be a biennial event when eminent anaesthetists will be invited to speak to the society and be presented with a T.Cecil Gray medal for the occasion. 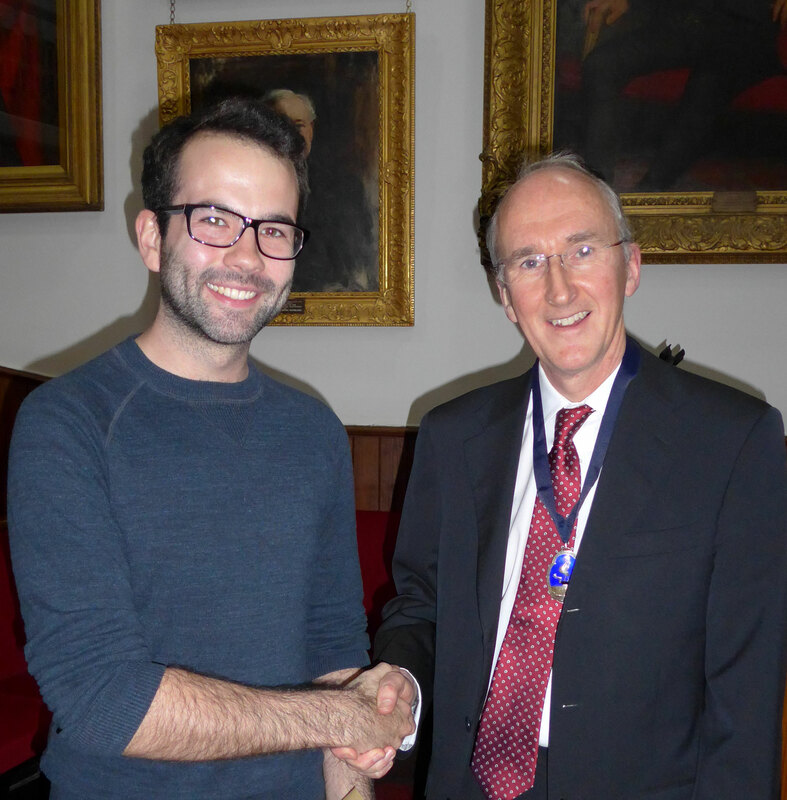 Congratulations to Dr Adie Morrison for winning the 2011 Trainees Prize with his paper "Systematic review of intrathecal magnesium given alone or in combination with LAs and opioids". 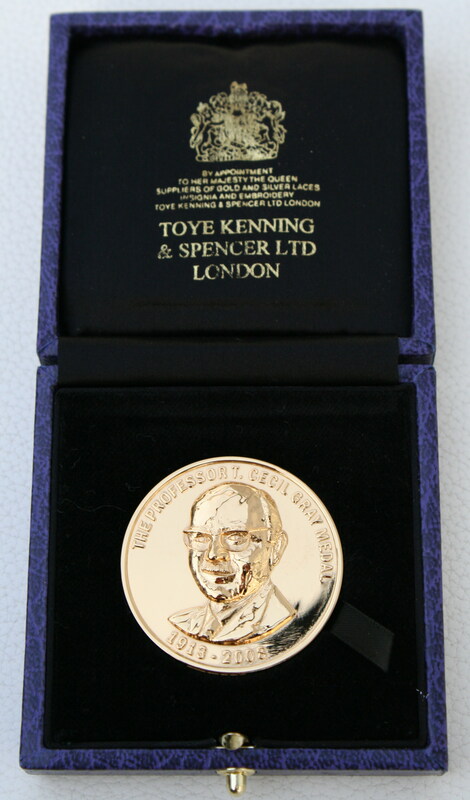 More information about the Trainees competition for the Jackson Rees medal can be found here. 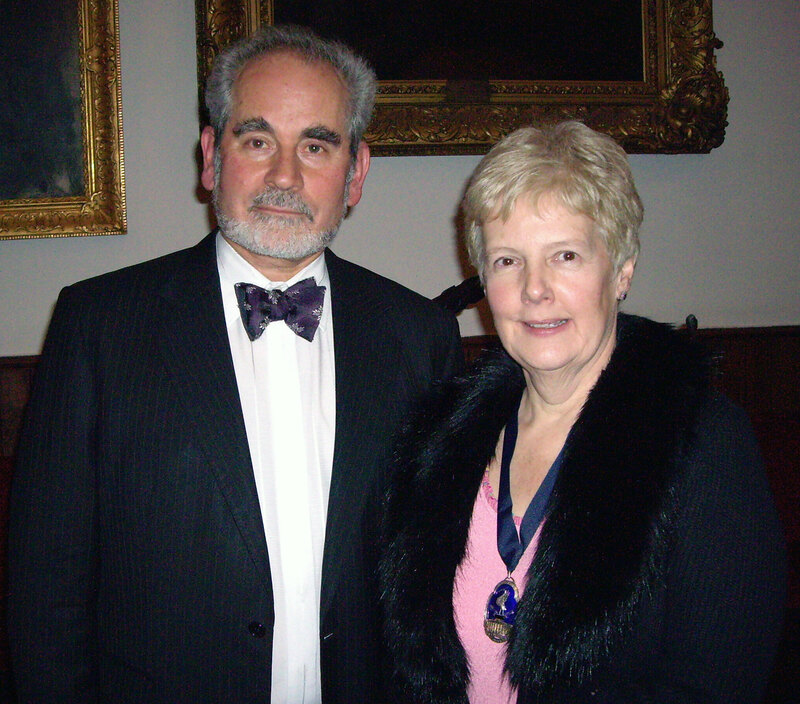 Dr Christine Bell, President of the LSA and Dr Iain Wilson, President of the AAGBI at the January 2011 meeting.